Digifest Postcard, a photo by trudeau on Flickr. DigiFest South will include a digital art exhibition by student and independent artists, a tech expose, Phenom Film Festival, Game Jam, TED talks, and other activites for all ages, says Clint McCommon. It also includes a career fair featuring cutting edge companies and educational institutions. To answer questions that artists, companies, or potential volunteers may have about the first-time event, BAC will hold a DigiFest Forum on Thursday, July 31st at 6pm at their headquarters: 630 Barksdale Blvd, Bossier City, LA. 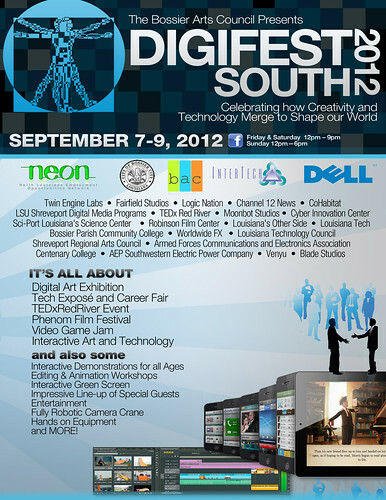 More on Bossier Arts Council and DigiFest at www.bossierarts.org or at 741-8310. In 2011 Shreveport painters Talbot Hopkins and Laura Noland-Harter were joined by Phyllis J Pease, Manhattan Kansas, in a show at Artspace Shreveport curated by a long-time friend and Artspace artistic director William Joyce. The show, entitled "Oh, Really," for the painters' penchant for realism, has traveled to the Strecker-Nelson Gallery, Manhattan, Kansas. It will be on display Aug 3 to Sept 15. 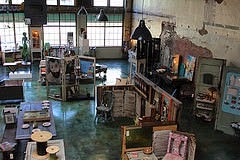 CC Hardman Co Art Supplies and Framing, Shreveport, a photo by trudeau on Flickr. An Open House on Fri, July 27, 4 to 6 pm, marks the official opening of CC Hardman Co. at the new shop, 33 09 Line Ave, Shreveport. 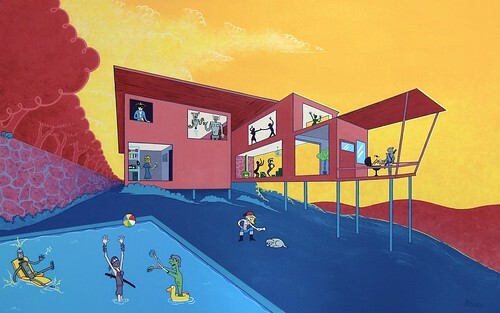 Pool Party: tonyreans.com, a photo by trudeau on Flickr. Three serious young painters open a show at Gallery Fine Arts Center on Thurs, July 26. They are Joshua Chambers, Tony Reans and Joey Slaughter. Their canvasses are witty, colorful and collectible. They have paid dues in development via shows and reviews and in working through various phases of artistic development. Meet the artists on Thurs evening, 6 to 8 pm. 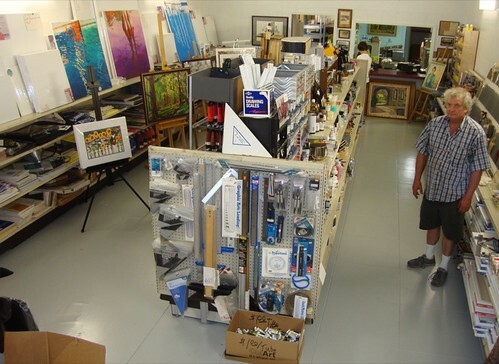 Gallery Fine Art Center is in Airline Plaza at 2151 Airline Drive, Suite 200. They are adjacent to Monjunis and 2Johns Restaurant. www.jmarieliving, a photo by jmarieliving on Flickr. "Inspired by nature, Shreveport native Jennifer Marie brings a combination of bold, chic, urban pizzazz and an international flair to her line of home accents," says the young designer. 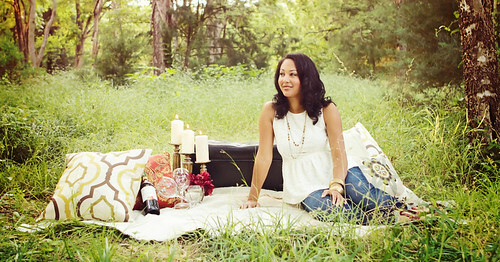 See a preview of her custom pillows, lighting, furniture, mirrors & home décor at the J.Marie Living Launch Party, 6 p.m. July 26, at the Remington Suites Hotel, 220 Travis St., Shreveport. Having watched her career develop I can add that Jennifer Marie is young Shreveport at its best. Well-educated, well-spoken, ethical and anxious to please, you will find this designer to be a persuasive guide to classic good taste. Joe Osborn, a photo by oneeyeddogblues on Flickr. 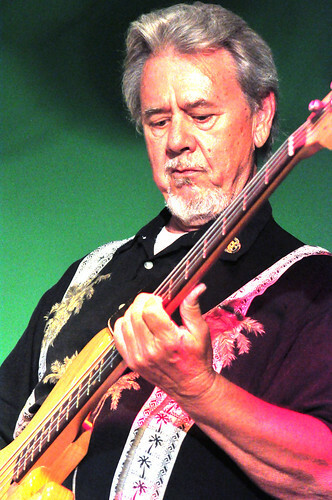 "Many bassists strive to have that one hit song, but Joe Osborn has more chart-topping records than he can even keep track of," writes Kevin Johnson at NoTreble.com. 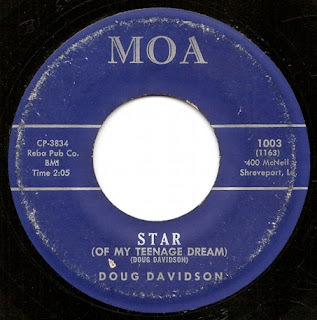 "His signature tone – achieved with flatwound strings and a pick – underpins an overwhelming number of pop, rock, and country hits from the ’60s through the ’80s, and his resume reads like a who’s who of music history." Descriptions of his 10 top sessions - along with sound clips - comprise a lesson in American pop culture. Today, he told Johnson, he is "continuing work with Richard Carpenter, producing up and coming guitarist Matthew Davidson, and writing a memoir." Osborn photo by Barbara Beaird. 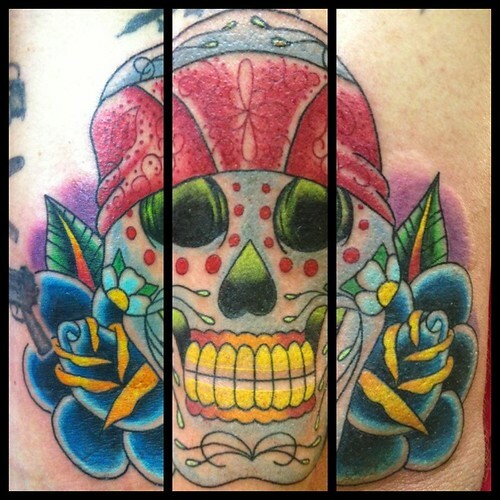 Tattoo: Micah Harold, Shreveport, a photo by trudeau on Flickr. "You are cordially invited to attend an exhibition highlighting the art and the artists who honor the timeless and often sacred tradition of tattooing," says Micah Harold. LIve music: Stolen Pills of Monroe, LA, and Dankhdjinn of Shreveport. Peter Fetterman will perform with fire. 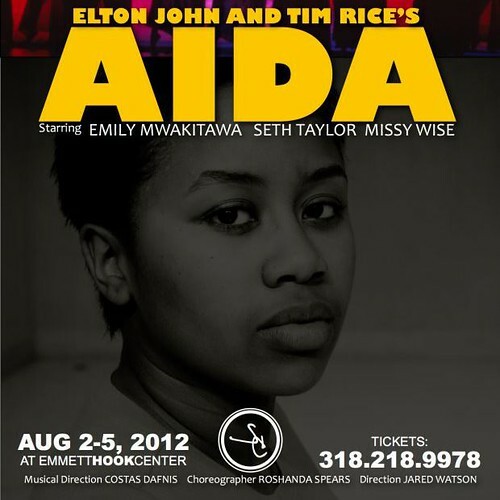 Emily Mwakitawa as Aida, a photo by trudeau on Flickr. The winner of 4 Tony Awards, including Best Original Score, Elton John and Tim Rice's Aida embraces exuberant dancing, staging and singing. Directed by Jared Watson, with choreography by Roshanda Spears, and musical direction by Costas Dafnis. Aida is Emily Mwakitawa (returning from her new home of New York City), Seth Taylor is Radames, and Missy Wise is Amneris. Supporting players are Thomas Keys (Mereb), Don McCoy (Zoser), Jori Jackson (Nehebka), Herman Johnson (Amonosro), and John Goddard (Pharoah). Ensemble members Delia Caldwell, Madeline Hiers, Elissa Little, Kezia Pigford, Misty Shadd, Tianna Williams, Tierra Williams, Will Callahan, Paul Savage, Gentry Williams, Barbara Holmes, Mary King, Reaiah Kirkendoll, and Eve Mwakitawa. 318.218.9978 All performances at Emmett Hook Center, First United Methodist Church, Shreveport. Student Rush for College and High School students with valid I.D., 5 minutes prior to curtain, for $10.00, cash only. 1 ticket per I.D. Meet actress Emily Mwakitawa in a series of Stage Center videos. Catch a screening of The Fantastic Flying Books of Morris Lessmore and Q&A led by Moonbot Studios artists Joe Bluhm and John Durbin, Sat, July 21, 11 am, at the Louisiana State Exhibit Museum, 3015 Greenwood Road, Shreveport. The event will conclude, says Sara Hebert, with a demonstration of the IMAG•N•O•TRON, an augmented reality iPad/iPhone app companion to The Fantastic Flying Books of Mr. Morris Lessmore picture book, a New York Times bestseller. The Blum-Durbin screening is part of the museum's “Remember in Shreveport When…” program. · A re-issue of "Tarzan of the Apes"
DSC02962_2, a photo by trudeau on Flickr. DigiFest is a start up event which will attract world class companies and experts who specialize in state of the art media. These include Academy Award Winner Moonbot Studios, Twin Engine Labs, Blade Studios, Worldwide FX, the Cyber Innovation Center, Venyu, and more. 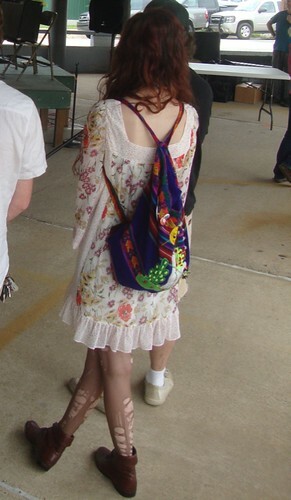 See applications for artists ($10 per entry) and vendors at http://www.bossierarts.org/. 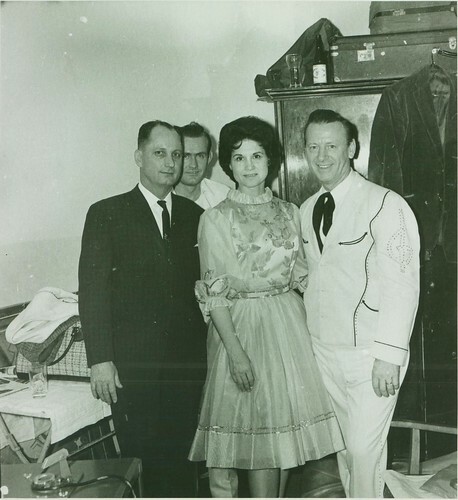 The late Kitty Wells, the Hayride and Elvis in Tillman Franksautobiography, "I Was There When It Happened"
Dad with Kitty Wells and Johnny Wright, a photo by CarlaCarlaCarlaCarla on Flickr. Kitty Wells has died at the age of 92, writes Bruce Flett. She was the first woman country music star and spent some of her most productive and formative years in Shreveport. Kitty was married to Johnny Wright, of Jimmy and Johnny , the country duo who were regulars at Shreveport's Louisiana Hayride as far back as 1948. Louisiana legend J D Miller of Crowley wrote a song that was an "answer" to Hank Thompson's hit "Wild Side of Life." Kitty Wells recorded that song by Miller, which was, "It Wasn't God Who Made Honky Tonk Angels." It went to #1 in 1952 - the first #1 hit in Country music by a woman. In 1954, Jimmy and Johnny got an offer for $500 (big money back then) to perform in Colorado. They were booked at the Hayride that same night, so their manager, Tillman Franks, tried to line up a suitable replacement. Tillman was in Memphis and had heard about this teenager that was a local sensation. Thus it was that Elvis Presley's first performance in Shreveport - October 16, 1954 - was as a replacement for Jimmy and Johnny. Editor's note: If you like regional music history, I recommend joining the witty email blast from musician-historian Bruce Flett called Port Cities Museletter. Reach him at blucebird@gmail.com. On July 17, 2012, Margaret Lewis will be feted by the Mystic Knights of the Mau Mau (aka the Ponderosa Stomp Foundation) at the New Orleans Mint. Details of this show/interview can be found on the Ponderosa Stomp website, along with a few informative posts on their blog, plus a video overview of Lewis’ rich musical career. Check the link below to navigate to these sources. A recently formed women's art collective, Omen Art, is preparing to present their inaugural exihibition, says Camille Gladney. It is a show focusing on the heart of young-womanhood and the female body-image, and the experience of its many forms. For more info, please e-mail omenfart@gmail.com or phone Chrissy Wise (318) 470-5074 or Liz Jackson at (318) 773-8762. Artist as Entrepreneur workshops on SRAC agenda: "Artists, what do you need by way of development?" 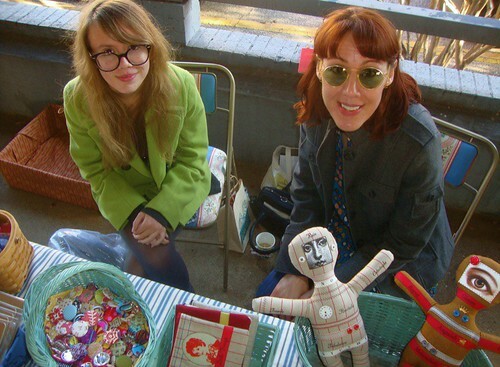 Staveley and Lisa Kuzmanov, Maker's Fair / Shreveport / Nov '11, a photo by trudeau on Flickr. "SRAC and the Arts Council of New Orleans are going to customize ACNO's award-winning artist entrepreneurial training program to fit what you need," says Wendy Benscoter to NW La artists. "Our artists need to say they want so that the program suits them." To express their thoughts artists should go to shrevearts.org/arts-culture/shreveport-common/artists-survey/. Bryan Connell, son of artist Clyde Connell and long-time household keeper for Clyde, has moved. He will reside near his daughter, Kay Colvin, outside Edmond, Okla. His relocation, in July, 2012, brings to an end the Connell family life in the cottage on the edge of Lake Bistineau after five decades. Clyde and husband TD Connell moved there in 1959. Several major pieces of Clyde's art that have been part of the furnishings of her house have been donated to the Louisiana State Exhibit Museum (LSEM), Shreveport. In the photo above are LSEM curator Nita Cole and Clyde's nephew, Dr. Pat Sewell, a neighbor on Lake Bistineau and also an artist. Also on hand for the art transit was LSEM director Wayne Waddell. The piece being moved is the large and early "Swamp Song." This version features raised-wall enclosures fashioned from brown paper and glue. Some of the corral-like enclosures contain segments of cork from wine bottles. The surface of the piece is covered with automatic writing script in black paint. Additional pieces of light-colored torn paper punctuate the surface. 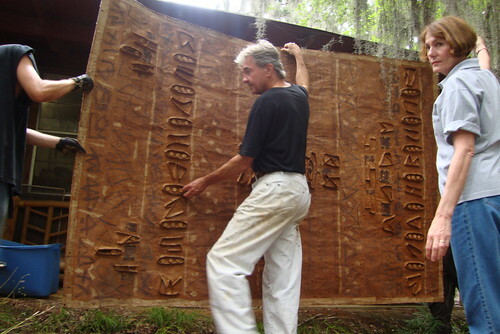 Connell created a large number of pieces on brown paper as she transitioned from her versions of the image of the lake ("Lake Verticals," her wavy-line logo, etc) to her hieroglyphic depictions of the sounds that surrounded the lake. This "Swamp Song" was signed "Clyde Connell." Evidently she had not yet developed her cartouche-enclosed "CC" signature. Waddell has been successful in reviving funding and activity at LSEM, the history and art center on Greenwood Rd, the Fairgrounds, Shreveport. It is a Smithsonian Institution Affiliate and on the National Register of Historic Places. Devotees of Connell will certainly appreciate LSEM as a new site for the preservation of the Connell legacy. Please see images of moving day at www.flickr.com/photos/robert_trudeau. Also, a source for background and news relating to the honored Louisiana artist is Clydeconnell.blogspot.com. 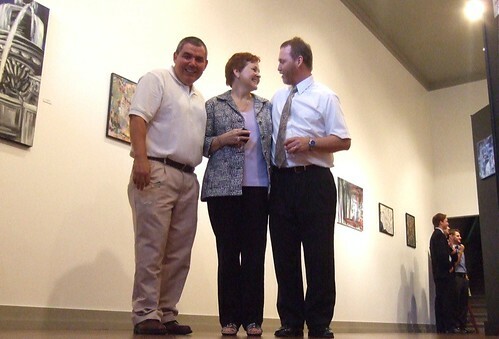 Dominick Salas, Christine and Chris Bailey, Norsworthy Gallery, Shreveport, a photo by trudeau on Flickr. "This exciting exhibit features fantastic artwork from members of the Hoover Watercolor Society," says Rachel Hill. "With dozens of pieces in a variety of mediums, there's only one thing that ties this group of compositions together--maybe you'll figure it out when you see them!" "Artwork is for sale," continues the wry Ms Hill, "and is breathtakingly affordable." Cinematographer John Lindley / Costner-Hurt-Moore film, 'Mr Brooks '/ all photos by Talbot, a photo by trudeau on Flickr. "Audience voting will determine half of the points needed to win the Louisiana Film Prize," says Cazes Verbois. "The top 20 movies, all from 5 mins to a maximum of 15 mins in length, will be screened at 2 locations on the weekend of Oct 5 - 7: Robinson Film Center and minicine, which is at 846 Texas Ave."
"An Official Jury, made up of artists, critics, writers, filmmakers, and educators views the public exhibition programs and award points to the films. Those points count for 50% of the final tally towards the winning film," continues Verbois. "The other 50% of the final vote comes from the audience by popular decision. Any registered attendee may vote using their uniquely numbered voting band. A voting band is acquired with the purchase of a festival pass." The festival, a project initiated by Kathy Melancon and Gregory Kallenberg, also promises to inundate Shreveport in creative film marketing on the first weekend in Oct. They have decreed that, "We encourage filmmakers to bring their friends, family, and anyone they can find on the street to buy a ticket to the LA Film Prize Weekend and vote for their film. We encourage the finalists to hold parties, pass out fliers, grab people off the street. It’s up to you, but the more people that vote for your film, the more likely you are to win." 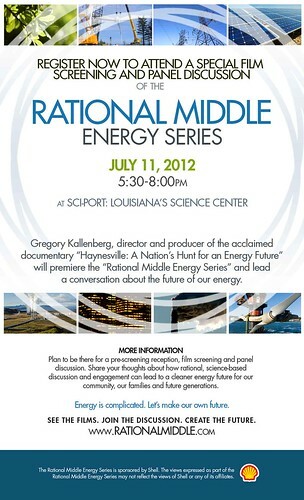 Rational-Middle-Energy-Series-Invitation---Shreveport, a photo by trudeau on Flickr. Having won awards and plaudits for the movie "Haynesville" - an invitation to present a TED talk and a presentation at the Aspen Ideas Conference - Gregory Kallenberg has positioned himself to lead thinking about energy usage. 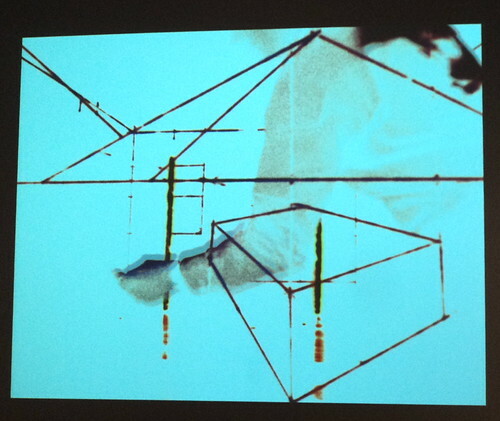 At SciPort on Wed, July 11, 5:30 to 8 pm, he will host a reception, screening of excerpts from his new work, "The Rational Middle Energy Series" and a panel on energy planning. It is hard to gainsay his mantra: "Energy is complicated. Let's make our own future."